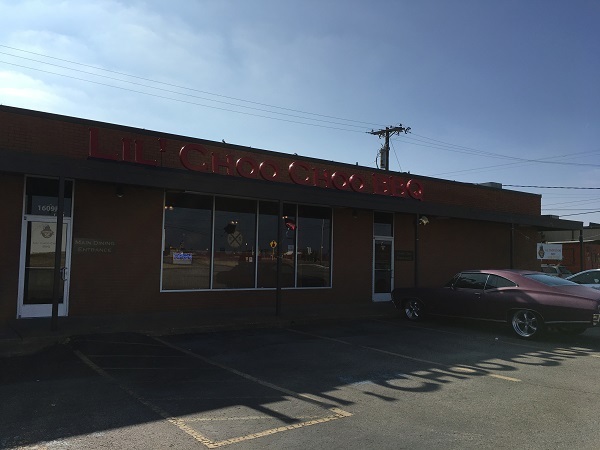 Lil’ Choo Choo BBQ, Nashville TN – Marie, Let's Eat! Six months in Tennessee and we’d only visited one new-to-us place in the state’s capital city. We took a day trip in November to shop, visit friends, and sample a few more restaurants. One breezy and chilly Saturday that forced me to finally wear jeans and proper shoes, we drove a couple of hours northwest to get some barbecue and see our buddies. 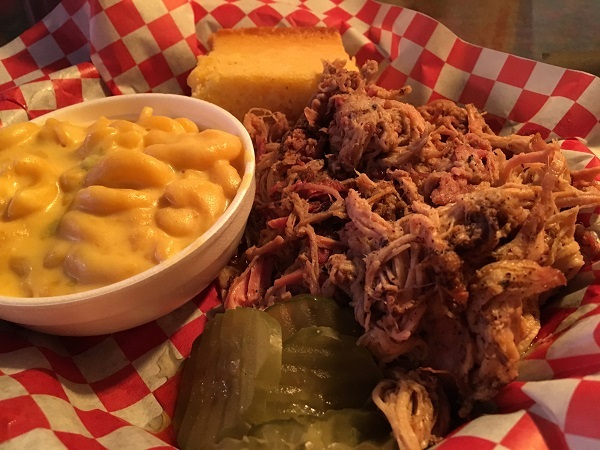 I picked a couple of promising places by reading some recent stories at a very good Nashville-based blog, The Barbecue Fiend. First up, a place that started as a food truck five years ago and opened its first brick and mortar store on US-41 near the airport about six months ago. 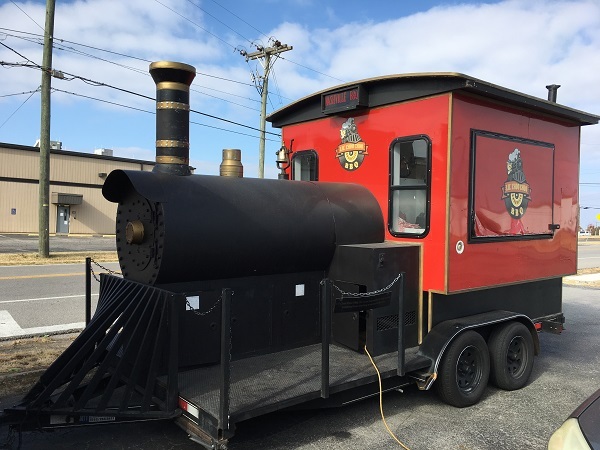 Lil’ Choo Choo BBQ still uses their truck for catering and events, and it is one of the cutest food trucks that I’ve ever seen, shaped to look like a locomotive engine. Also, because I’m ridiculous and get songs stuck in my head, their name Lil’ Choo Choo reminded me of “Little Cho Cho,” and I had Malcolm McLaren’s oddball version of “Madame Butterfly” running between my ears for the next eight hours. I ordered a pork plate with one side, and instead of beans or slaw like I might normally have in Tennessee, I went with their jalapeno mac and cheese because I remembered the Blaxican’s wonderful version of that in Atlanta and miss it. They have six sauces to choose from: mild and hot versions of a typical Tennessee sweet sauce, mild and hot versions of a Kansas City-style sauce, a “Carolina vinegar” which is a little like Lexington-style, and (north) Alabama white. Before I could sample any of the sauces, however, I needed to tamp down the meat a little. It’s very smoky and very pink, and has a great flavor, but my serving was also quite greasy. I enjoyed the vinegar sauce and the hot KC sauces mixed together, but, along with the mac and cheese, this turned out to be a very heavy meal. There was a neat little extra waiting for us when we arrived for lunch. As it turned out, this was the first day that they offered barbecue baked potatoes on the menu, and so Marie became the very first guest to order one. We were pleasantly surprised to see that they used melted cheese rather than shredded. That certainly changed up the flavor and texture! Marie really loves the flavor combination of chopped pork with a sweet sauce along with potato and cheese, but I think that using so much, melted, made the cheese a little too dominant. This location is a bit desolate, and I’m not honestly sure they can rely on too much lunch traffic here, but the people are extremely friendly and welcoming and they’ve got a good product. They’re definitely worth considering among Nashville’s other good barbecue options and I hope they do real well. Are you planning a barbecue road trip? You can see all the barbecue restaurants that we have visited for our blog (more than four hundred !) on this map, with links back to the original blog posts! 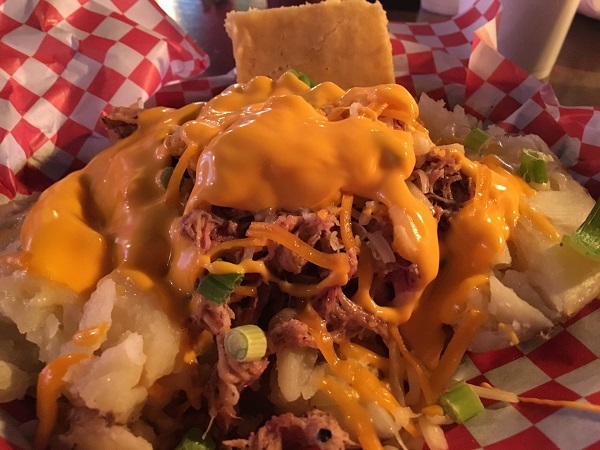 Posted on January 16, 2017 by Grant G.Posted in barbecue, nashville, tennesseeTagged barbecue, nashville, tennessee.